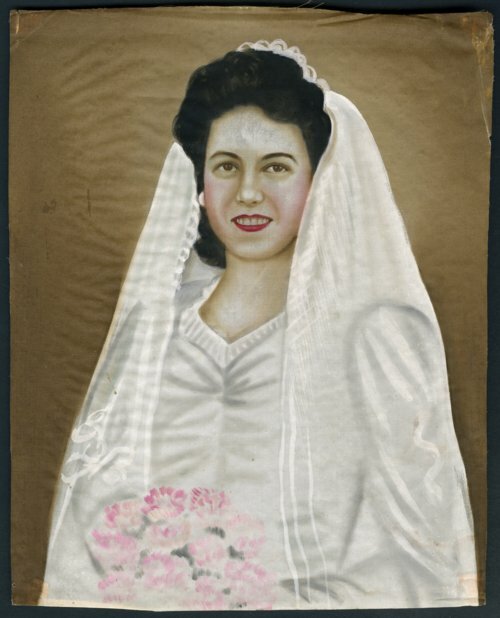 This is a painting of a photograph of Hazel Gomez on her wedding day, April 16, 1944. Robert, her husband, served in the Navy as a fireman from 1941 to 1945 and again during the Korean conflict from November 1950 to December 1951. He painted the portrait while serving in Japan during the second world war. Robert, along with Hazel and numerous others, was a founding member of the League of United Latin American Citizens (LULAC) Council #11071 (a national civil rights organization) and served as its president from 1986-1989. Hazel began her volunteer activities as a teenager. In 1942, she helped organize and served as president of the Y-Senoritas club, sponsored by the YWCA. They helped soldiers stationed in and near Topeka lead a more active life outside the military. In 1943, she was queen of Our Lady of Guadalupe Fiesta. Hazel served as LULAC president from 1977-1979 and 1983-1984 and as state director from 1980-1983. She advocated on behalf of the elderly, serving as chairperson for the advisory board for the LULAC Elderly Center in 1973, secretary for the La Colonia Elderly Housing Project board from 1982-1984 and as its president from 1984-1985. In addition, she was vice president of the silver-haired legislature board from 1982-1984 and was a delegate to the 1995 White House Conference on Aging. Hazel was honored with numerous awards for service including the 1977 Kansas LULAC Outstanding Service Award, Outstanding Leadership Award at the 1982 National LULAC Convention, and the LULAC Women's Hall of Fame Award in 1992. Additional awards include the 1992 Governor's Martin Luther King, Jr. Award and induction into the Kansas Women of Color Hall of Fame. In February 2001, the Kansas Senate passed Resolution No. 1822 in memory of Hazel for over 60 years of community service to the Hispanic Community. After Robert's death in 2001, Living the Dream, Inc. named an award for the couple, the Robert and Hazel Gomez Alma (soul) Award, in memory of their hard work and community service.